Interesting -- the classing seems a little complex, eh? Considering that the driver will be the big difference, some of the rules seem to be hair-splitting. 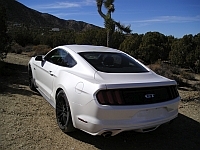 After reading your post, I scanned the rules and one interesting thing I saw was that a 5.0 Mustang GT is one class higher than the 03-04 Cobra. Having owned both, that seems odd to me. And, of course, all the various other requirements go on and on. But, since it is not something that interests me, I only was curious how well they will do in attracting participants, with all the classes and rules that they have? I guess they expect to succeed so there must be a semi serious group out there that are prepared to enter the event(s). But, I can't imagine why?